It is CCI indicator with very smooth and noiseless movement that calculates four levels of buy, sell, overbought and oversold dynamically. Professional traders know well that level of 100, 200 or -100 and -200 are not always right and needs fine adjustments. 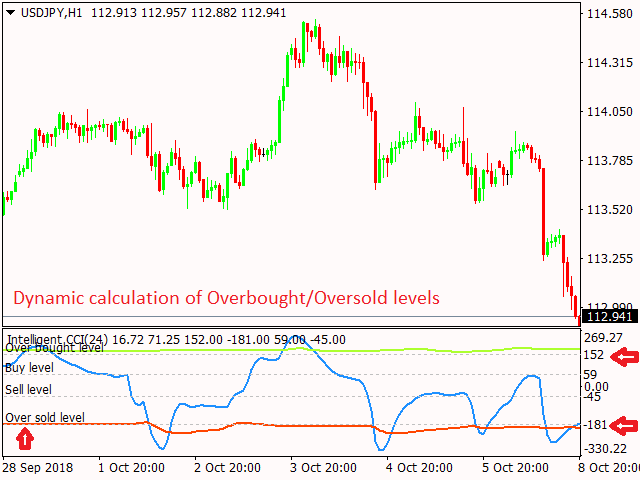 This indicator calculates those levels dynamically by using mathematics and statistic methods in addition to shows divergence between indicator and price. Promotion Price is 20$ for one year rent. Please add review and give 5 star if you are satisfy with it and receive free updates. Smoothed to filter the noises you see on CCI caused by market volatility. Non-Lagging averaging algorithm with digital signal processing to filter the noises. 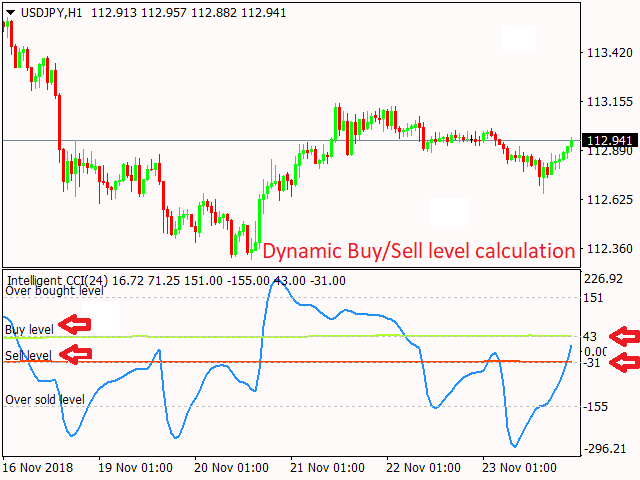 Intelligent to dynamically calculate real CCI buy and overbought in addition to sell and oversold levels. 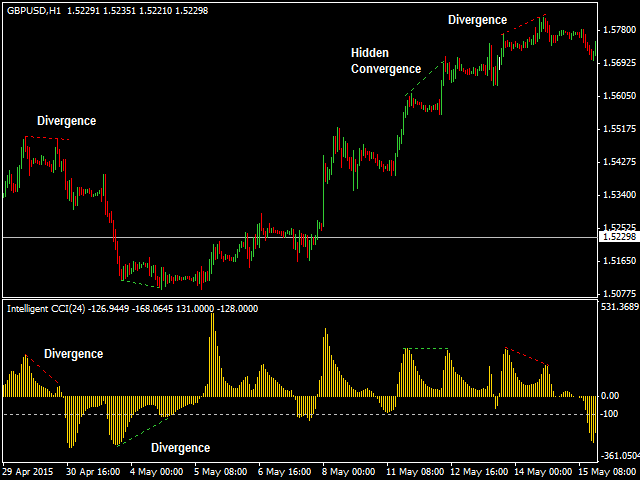 Divergence detection between price and indicator. 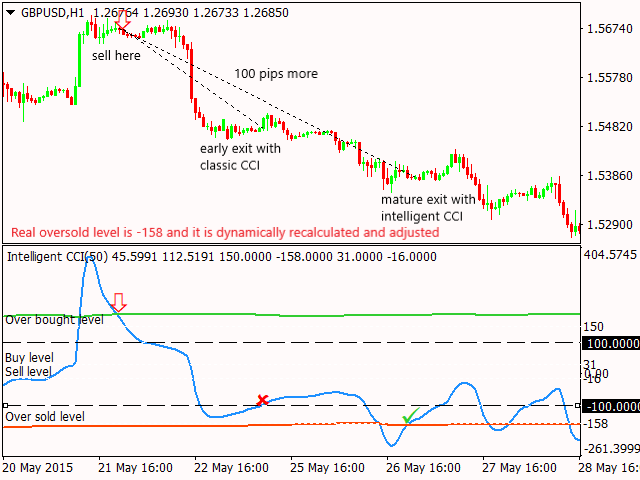 Draw arrows and provide signals when CCI leaves/enters Buy/Sell or Overbought/Oversold areas. Safe Signaling to provide signal according to main trend not against of it. CCI Period: like the original CCI. For how many bars calculate levels: number of bars for drawing sell/buy and overbought/oversold levels. Due to required high computing and statistic calculation, do not set it to a large value. CCI smoothing level: smooth the CCI moves as a superior non-lagging and non-overshooting Moving Average. Depth of used candles for mathematics: To select the depth of history of candles used in dynamic calculation of sell/buy and overbought/oversold levels. Show original CCI: enable drawing the original CCI simultaneously with Smoothed CCI. Type of signal: Type of signals are "leave buy/sell area", "enter buy/sell area", "leave overbought/oversold area" and "enter overbought/oversold area". Trend oriented signalling: To filter the signals against the main trend. 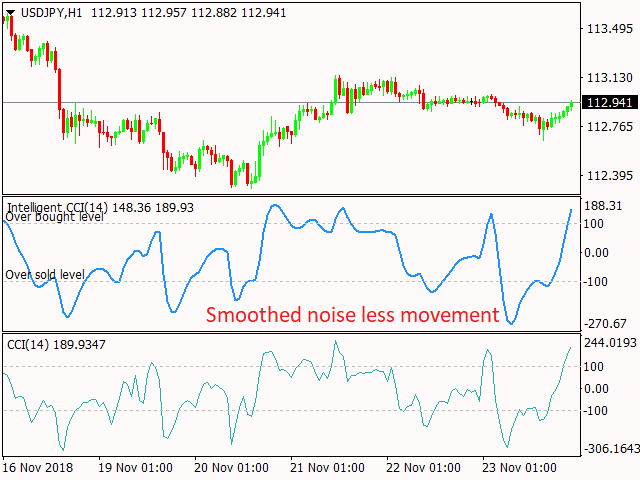 Show divergence: show possible divergence over the indicator. 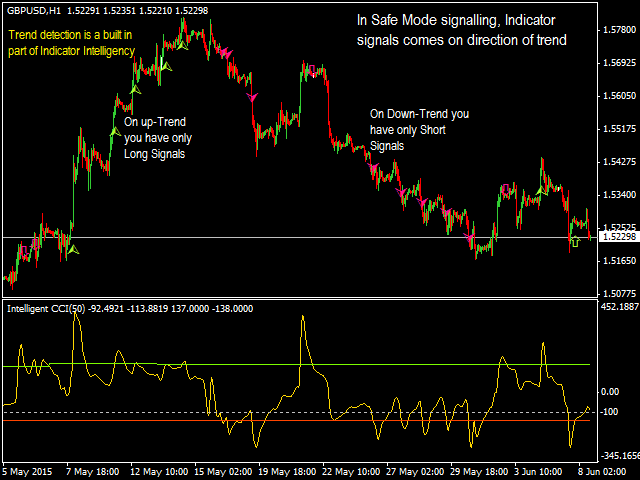 Alert for signals: Enable/Disable alerting in case of Buy or Sell signal. Notification for signals: Enable/Disable push notification message over you mobile handset in case of Buy or Sell signal. 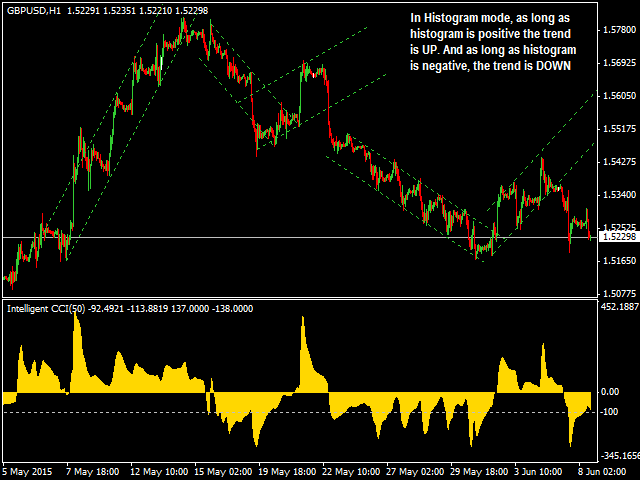 Indicator drawing mode: Select type of Indicator to draw as a histogram or a line. My team are success trading by CCI and Intelligent CCI make it more easy. They are using Intelligent CCI . High Recommended for CCI traders. Appreciate Yasser for quick and great service mind supported. As probably everyone who reads this has done, I too have looked for a predictive indicator throughout the market. This is the first and only indicator I've ever seen that is actually predictive, and will accurately tell you when and where the momentum will change. Having said that, in the market we know there are divergences from what SHOULD happen vs. what ACTUALLY happens. The market movers push further into a direction past where the market is over sold/bought, with the intention of blowing out stops, everyone should know this. This indicator clearly shows where the market SHOULD go, and has pretty incredible accuracy. Worth the investment. Interesting indicator. I can see the potential. It's more flexible than competing CCI indicators, but user needs to test different settings (which is pretty easy to do in the MT4 tester). - "Safe mode signalling" input name changed to "Trend oriented signalling"
- calculation of sell/buy and overbought/oversold levels is performed faster. - added new buffer to help programmers catch the signals. - some input parameters removed for better understanding. - less complicated to use than older versions. 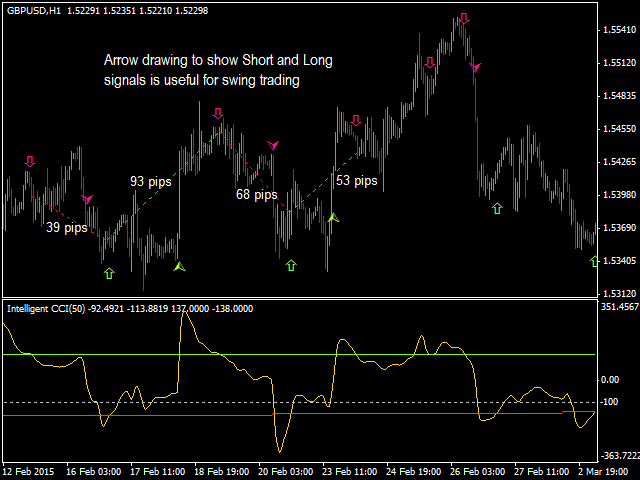 -Custom Color for Signal Draw Arrows in chart added. - Symbol names and Time Frame comes now in Alert and Push messages. 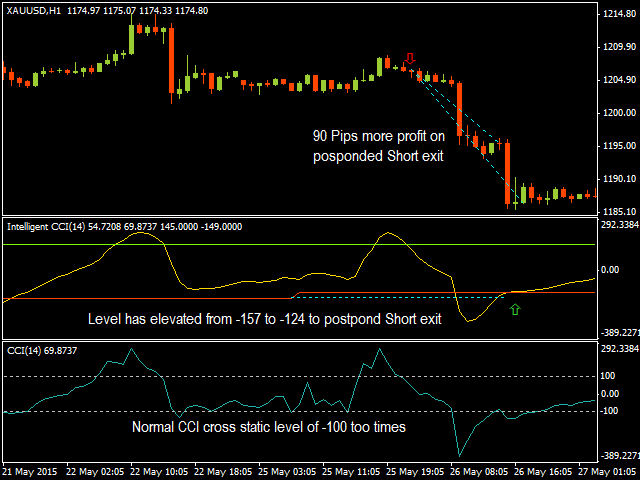 Now it works fine for scalping in M5 and M1 by right signals. Indicator is limited to not use more than 100K candles to dynamically calculate and draw Overbought and Oversold areas. Useless inputs, the CCI_MOVE_CONTROL and the REVERSE_BOUNDARY removed. Indicator Levels now automatically sets on Overbought and Oversold levels. - Type of signals is selectable as an indicator input. 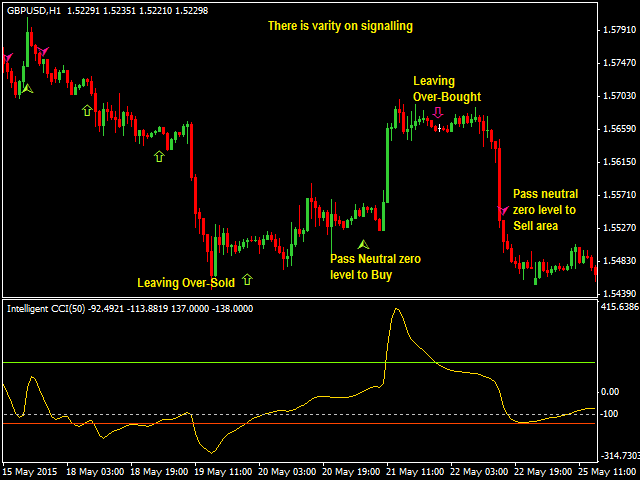 - Added a number of bars available on a chart in the indicator name used to calculate overbought and oversold areas. - Use built 840 ObjectsDeleteAll prefix to just remove indicator depended objects instead of all chart's objects. - Bug fix to call "Intelligent CCI.ex4"